He is what a true Muslim ought to be; caring for fellow humans from his heart, mind and soul, and he lived the simplest life among the people he served with no distinction. He is the Mukhlooqul Aalameen – God’s man for the universe. He belonged to the whole humanity and his love for people had no bounds. A few months ago, he surprised the entire world and got adulation from around the world. A little girl who was deaf and mute was lost in Pakistan some 13 years ago, and no one knew her whereabouts, but she sounded like a Hindu girl. So Mr. Edhi and his wife Bilqees both Muslims raised Geeta, in her own tradition including taking her to the Hindu Temple. This is the height of respecting the otherness of others and respecting the God given uniqueness of each one of us. He was secure in his faith and I pray more of us feel secure about our faiths to learn and honor the others with equal reverence. Such was the power of his faith! 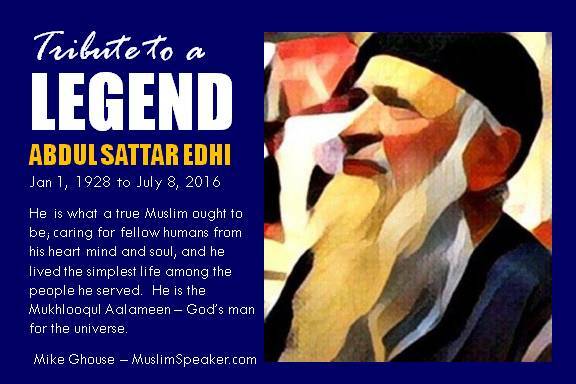 “I am sad at the demise of Abdul Sattar Edhi. He was s true worker for humanity. He treated people with utmost respect regardless of cast, color, creed, religion etc. He truly followed Jinnah’s vision for Pakistan. His death has left a big vacuum and I hope and pray that his foundation will carry on his mission.” Vasdev Lohano, MD. Mr. Edhi was truly a great man. He was someone who practiced what he preached. He taught people to do the right thing by doing it himself. Javed Samuel Gill, Plano, Texas. ਜੀਵਨ ਰੂਪ ਅਨੂਪ ਦਇਆਲਾ ॥Whose life is an embodiment of unmatched compassion. They kept aloof from politics even during the height of civil wars that the partition unleashed, and they continued to be engaged in humanitarian considerations. Nauman Anwar, Albuquerque, NM, “Edhi murhoom was the / is a living embodiment of a Hadith of Prophet Muhammad (pbuh) “the best among you is the one most beneficial to others”.